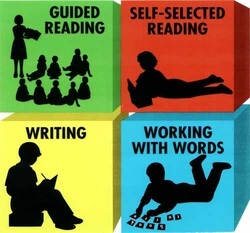 For my literacy lessons, I followed the four blocks teaching approach. The four blocks include guided reading, self-selected reading, writing, and working with words. I was able to create innovative and engaging lessons that incorporated real-world examples for each of the four blocks of literacy. When teaching literacy, I had a focus idea for students to learn about through reading books, magazines, and short stories that went along with our focus of the lessons. Some of these focus points included finding the main idea in a text, comparing and contrasting, and problem and solution in a text. I incorporated texts and resources from Discovery Education, Raz Kids, Study Island, and other sources provided. Below are some examples from some of the lessons that I taught during guided reading. When using writing, students are able to use this as a way to tell about an idea or something that they want to share. Students learn to write fluently, read through writing, apply grammar and mechanics, learn different forms of writing, and build self-confidence as they learn more strategies. We have worked on several different types of writing,including informational, opinion, persuasive, and poetry. We also followed The Writing Diner by Tim Hargis, and CAFE model of writing. When using Working With Words, students practiced spelling, learned about and created transfer words, studied prefixes and suffixes. Students learned to decode words by recognizing patterns and learned to spell high frequency words. Self-selected reading is a way for students to engage in their own reading interests, read at their individual instructional-level, build intrinsic motivation, and reading stamina. Students are able to read different kinds of literature through reading aloud as well. I helped administer the Scholastic Reading Inventory (SRI) test for students to help them find their Lexile score in reading, and strive throughout the year to increase their reading score.